that is equally at home with all decorating styles – from traditional to contemporary, casual to formal. However, because of the skilled craftsmanship involved, the cost for an inlaid wood table is often beyond the means of appreciating homeowners. An authentic inlaid wood coffee table typically costs between $1,000 and $4,000, or even more. Obviously, larger tables, such as dining tables are even more expensive. 1. 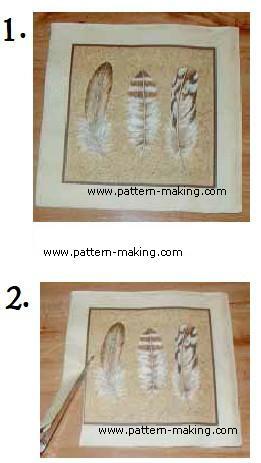 Select a package of decorative paper napkins with a wood-colored design. You can select napkins in neutral, solid colors to simulate solid wooden tiles, or choose a design such as this one (photo #1) to give the impression that a design has been burnished into the wood tile. Make sure there is a contrast in color between the napkin and the table. 2. Decide which portion of the napkin you will use for a “tile” and cut it out (photo #2). 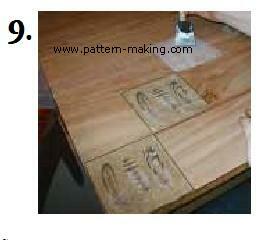 Remove all extra layers so that only the top “ply” with the design remains. 3. This technique can be applied to any wood or laminate table, but don’t use a natural wood table that you don’t want to varnish. If you’re working with a laminate table, before you begin decoupaging the napkins, just make sure the surface is clean from dirt, dust, and stains. If you are working with a natural wood table, brush the entire table with one coat of polyurethane varnish before you begin decoupaging. This serves two purposes: it protects the original finish and also will make the napkin“tiles” adhere smoothly. Polyurethane comes in several finishes. Depending on the brand you’re using, you usually can select from glossy,semi-gloss (also called “satin”) or matte finishes. Even if you are working with a laminate table, you still need to decide on your preferred polyurethane finish, because you’ll be varnishing the entire surface of the project when you have adhered all the tiles. 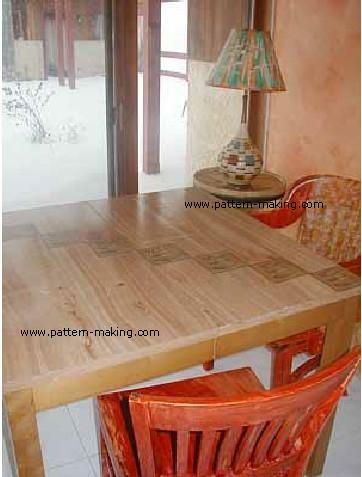 The table shown in these photographs was varnished with a glossy finish to highlight the faux tiles in natural sunlight and give the wood a polished sheen. 4. Determine how you want to arrange the “tiles” on the table. In this example, the napkins are placed in a diagonal line going from one corner of the table to the opposite corner. 5. With the paint brush or sponge brush, apply Mod Podge directly to the table in the shape of the first “tile” you will be placing (photo #5). 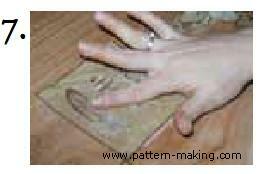 You can “eyeball” this – it’s not necessary to measure the area for the “tile” exactly, since the Mod Podge dries clear. 6. Place the napkin “tile” over the area with Mod Podge, starting at one edge and slowly laying the napkin down to cover the entire area (photo #6). The single ply napkin will be quite flimsy, so lay it down slowly and gently. it is adhered smoothly to the table (photo #7). finger directly up and down. off and start fresh with a new one. Again, don’t worry if there is a bit of excess Mod Podge on the table outside of where the napkin is – the Mod Podge will dry clear. 9. After making sure that all edges are securely glued to the table, repeat these steps to glue down the rest of the “tiles”, until the design is complete (photo #9). 10. Allow the Mod Podge to dry for about 20 minutes. 11. Once the Mod Podge is dry, the napkins won’t tear when you brush over them again. Coat the entire table with at least one coat of polyurethane varnish using long, broad strokes. 9.Voila! You have an inlaid wood table! Pretty easy, huh? napkin to other surfaces besides wood for a variety of looks.